Parkside Academy believes that the key elements of a good Careers Education, Information, Advice and Guidance (CEIAG) Programme should be to develop the self-awareness, opportunity awareness, decision making and transition planning skills of its pupils. It should also look to raise aspirations, broaden horizons and break down stereotypes. It should help pupils to understand the purpose and benefits of education and it should aim to inspire them to greater achievement in their formal qualifications as well as successful progression into the next stage of their lives and their longer term career ambitions irrespective of their starting points. 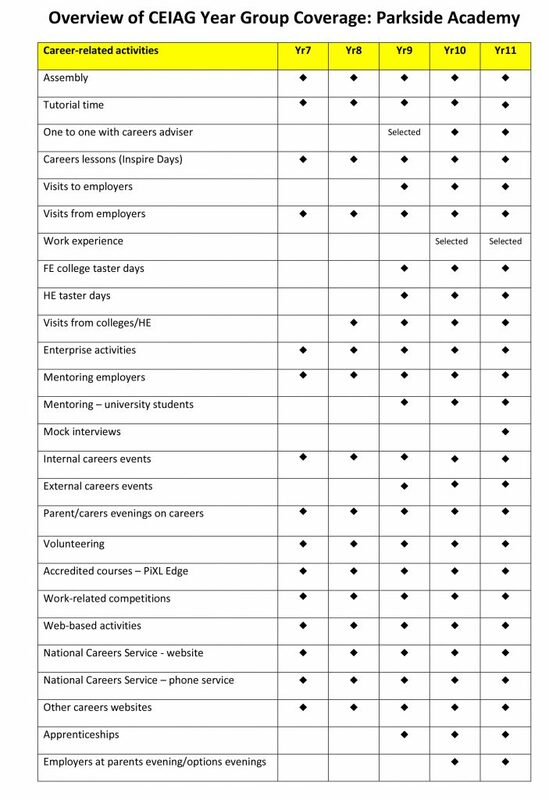 With this in mind we have compiled a range of careers websites in order to support pupils and their parents in researching and planning their future careers. Parkside Academy’s CEIAG programme is designed to meet the needs of all students and is based on the government’s statutory guidance for schools (December 2017). The key elements of a good Careers Education, Information, Advice and Guidance (CEIAG) Programme should be to develop the self-awareness, opportunity awareness, decision-making and transition planning skills of its students. It should also look to raise aspirations, broaden horizons and break down stereotypes. Parkside has a critical role to play in preparing young people for the next stage of their education or training and beyond. Expectations should be set high, including for the most vulnerable and those with special educational needs and disabilities, so that every student is stretched and acquires the attributes that employer’s value. This will help every young person to realise their potential and so increase economic competitiveness and support social mobility and future economic well-being. A robust and inspiring CEIAG programme should also be an integral part of the whole school and should be embedded within a clear framework linked to outcomes for students rather than as an ad-hoc set of activities. The programme should reflect the school’s ethos and meet the needs of all students. Parkside’s CEIAG programme is incorporated into the school’s Inspire Day Programme as well as offering a whole suite of other opportunities linked to the students’ needs at different stages in their school life. All students in Year 7 to Year 11 have the opportunity to access information from a wide range of education and training providers on all the different routes available to them including technical qualifications and apprenticeship routes. We believe that the whole school staff have a responsibility for the ‘careers education’ of the students and, therefore, it is important that all staff maintain an up-to-date knowledge of the opportunities that relate to their subjects, encourage students to explore ideas and are happy to provide additional information to students, or to refer them to other resources/colleagues with a more specific knowledge. In addition to the proposed CEIAG programme, we provide students with opportunities to experience the ‘world of work’ and to develop their key employability and enterprise skills throughout Years 7-11. This is achieved through their formal education as well as through extra-curricular activities both in school and outside of school. Finally, we aim to continue to develop a range of different resources, including through the school’s website and VLE, in order to support the students and their parents in researching and planning their futures. We work closely with Durham County Council, the local Area Action Partnership, The North East LEP, Durham Education Business Partnership, and other relevant agencies in order to offer appropriate support irrespective of ability so that all our students can make successful transitions within, and beyond, the school. Parkside carries out an annual review of its CEIAG provision. This is done by analysis of local and national NEET figures as well as student surveys. The provision is also mapped against the 8 Gatsby Benchmarks. Parkside’s published CEIAG information is reviewed annually in June of each year. A provider wishing to request access to Parkside Academy should contact Mr Roe who is in charge of CEIAG at the school. This can be done in the first instance by e-mailing at s.roe@parkside.org.uk or contacting the main reception on 01388 746 396.